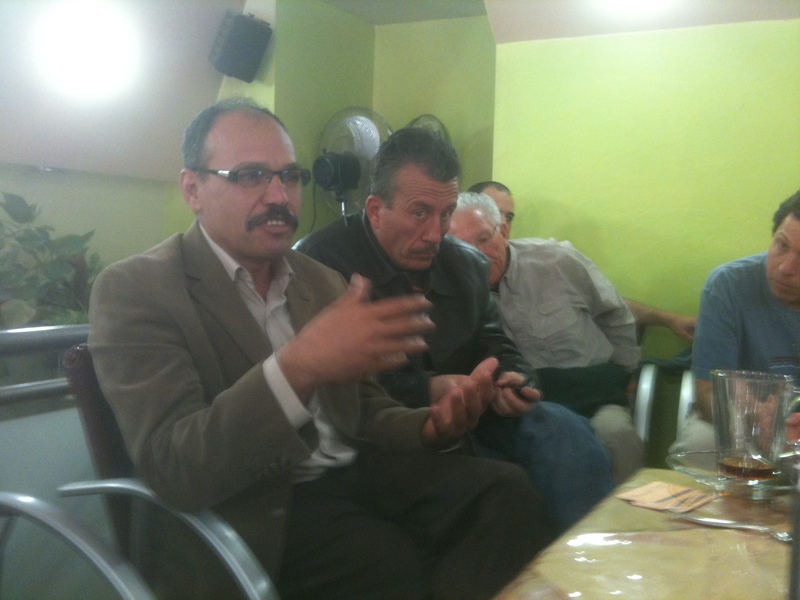 On Sunday morning we visited a cafe in Ramallah where we had meetings with a variety of Palestinian leaders. We gathered into the upstairs room of a coffee house and met first with an official from the Palestinian Authority. 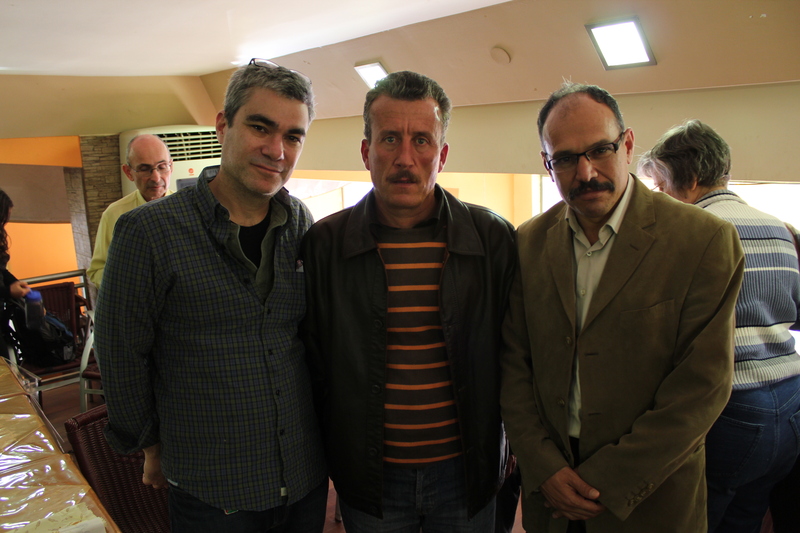 But the highlight of our meeting was as visit from two prominent Palestinian nonviolent leaders: Iyad Morrar from the West Bank village of Budrus and Bassam Tamimi from the village of Nabi Saleh. Iyad’s leadership in Budrus has recently become the subject of a new documentary film, which powerfully demonstrates how he brought together a wide coalition of villagers and solidarity workers to successfully keep the construction of the Separation Barrier from destroying their village. When I saw the film, my first impression was that while it was undeniably inspiring, it didn’t explain that Budrus is largely one isolated success story – and that the IDF is going its level best to suppress the Palestinian nonviolent movement through brutality at demonstrations and the widespread imprisonment of their leaders. When I mentioned this to Iyad and Bassam, they agreed without hesitation. There are in fact numerous examples of Israeli soldiers firing tear gas canisters and rubber bullets directly at protesters. 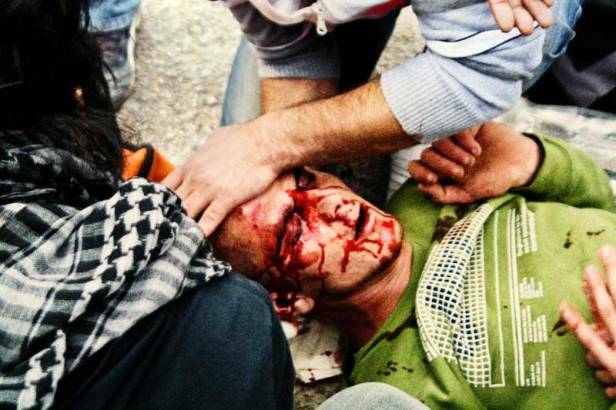 Just a week before our visit, an international protester in Nabi Saleh was severely injured after directly hit in the back of the head with a canister as he was trying to take cover (see below). I’ve been trying my level best on this blog to highlight the growth of nonviolent popular committees in the West Bank, which are enormously important and eminently worthy of our support. It was deeply gratifying to bring congregants to meet leaders such as Iyad and Bassam, who are resisting daily oppression with principled, moral steadfastness. Where are the Palestinian Ghandis, asks the American Jewish community? 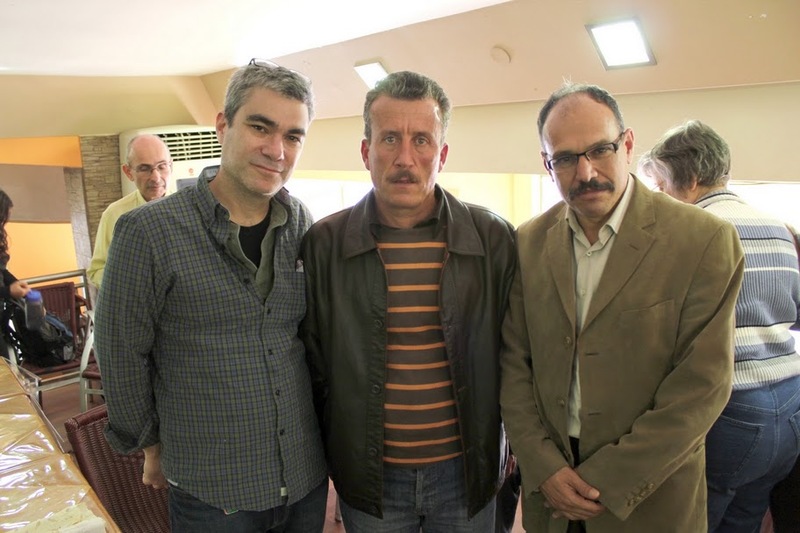 Well, we just met with two of them in a Ramallah coffee house. From Ramallah we headed due north to Jenin. It took our bus driver several attempts to find the right route as it is never immediately clear which roads are open and which are closed. We did however, sail through a checkpoint, which had been eased in honor of the Christmas holiday. After passing through Nablus, we arrived at the town of Jenin, and gathered in the main office of the Palestinian Fair Trade Association. JRC has been selling PFTA olive oil for years, thanks to the leadership of member Lynn Pollack. 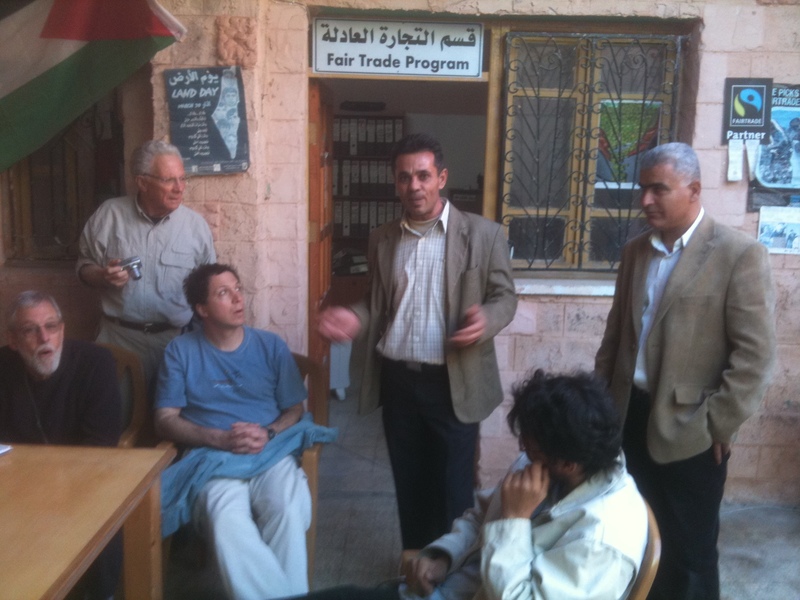 The PFTA is the largest fair trade producers’ union in Palestine, with over 1700 small Palestinian farmers joined in fair trade collectives and cooperatives across the country. They work with olive farmers’ cooperatives through the northern West Bank and women’s village cooperatives that produce cousous, za’atar, sun dried tomatoes, olive oil soap, etc. We then visited the PFTA’s main exporter, Canaan Fair Trade and were given a tour of their impressive facility by Administrative Manager Ahmed Abufarha (below). 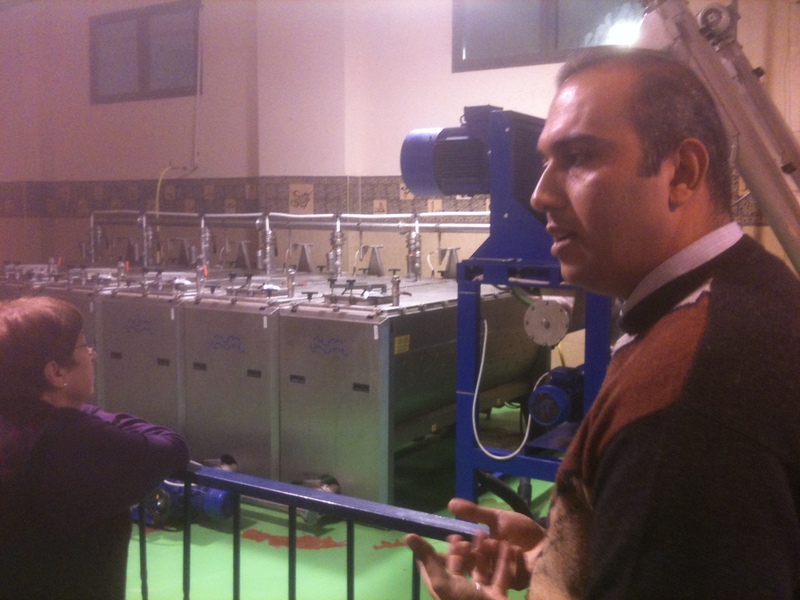 This multi-level operation is where coop farmers bring their olives to be pressed, stored, packaged and shipped and where their other products are prepared for export as well. Much like our visit with Iyad and Bassam, our visit the Jenin fair trade community is an important reminder that there is a West Bank reality beyond the headlines that we read every day. Our job, we now realize, is to bear witness to these realities – to cultivate these relationships, and to do our part to extend them to the world upon our return. After touring the Canaan Fair Trade facility, we broke up into groups and went off to our home visits. I was in a group of four JRC men who stayed with a family in ‘Anin – a West Bank village 15 minutes west of Jenin, just east of the Green Line. During the course of the evening, several men from the village gathered in the living room to meet us. Between our mutual English, Hebrew, French and pigeon Arabic, we were able to communicate quite well. At one point, we mentioned that we were American Jews and that I was a rabbi – a revelation that stopped them in their tracks somewhat. After the initial bewilderment, however, our freewheeling conversation continued on and on. At one point, they pulled out the nargila pipe and we puffed away, I confess, with a fair amount of abandon. Danny Newman, who is a High School math teacher talked extensively with another young man from the village who teaches High School Physics, comparing notes. Michael Deheeger, who speaks fluent French, spoke with another man who studied engineering in Algeria. I talked politics with a young man who wanted to know what I thought of Obama and if I thought he would be able to broker a peace treaty. After a while, the young men asked us if we’d like to go for a walk through the village. While it had been a long day for us and it was starting to get pretty late, we all readily agreed. It was a mild evening with a dazzlingly clear night sky as we walked through the winding roads of ‘Anin. They showed us two of the natural springs of the village, which produce sweet, fresh water that runs off from a nearby mountain. We then stopped on the side of the road, built a campfire (which we were told was lit up there every evening) and sat around chatting, smoking locally made ‘Anin cigarettes. Like our experience in Deheishe, our visit was extraordinary for its simple ordinariness. For our part, we were taken by the humanity of our new friends, which is readily evident despite the obvious turmoil of their day to day existence. We were also moved by their genuine curiosity in us, their desire to get to know us better and host us in their village again. For me, and I think most of the members of our trip, this has been the most transformative experience: getting to know new friends and breaking down the politically-driven barriers that have long kept us from connecting in such a simple but immensely important way. I do not hesitate to say we will continue to nurture these connections and will return to visit these new friends as soon as we can. 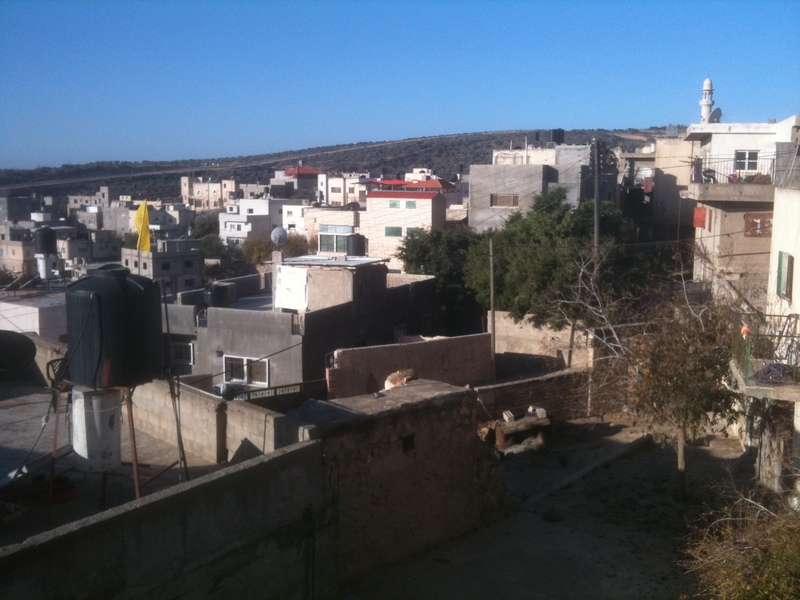 My next post will describe our final day in Jenin and offer some final thoughts. I’ll also post some thoughts from trip members, all of whom had been profoundly transformed by this journey. This entry was posted in Fair Trade, Human Rights, Israel, JRC I/P Study Tour 2010, Nonviolence, Palestine on December 29, 2010 by Rabbi Brant Rosen. Rabbi Rosen and company, this is a truly extraordinary travelogue, the likes of which has never been seen. The obvious care in the planning of the itinerary – obviously a group effort — your meticulous accounts of each event, with photo support, your fine writing and the overweaning humanity and integrity of the whole voyage are very moving! Thank you, toda, shulkran! Yet another story in so many that I have read/seen about the humanity of the Palestinians. As one who has relatives who say “the Arabs are animals!” yet who know not a single one, I try to use accounts such as yours to bring a transformation. With the miracle of the Internet, it is very difficult to maintain prejudices, unless one values a prejudice more than the truth. I too visited Anin as part of the Interfaith Peace Builders delegation that went to Israel/Palestine in November, 2011. I and three other delegates were welcomed into the Yassin family home to spend the night after visiting the Canaan Fair Trade Co-op in Jenin. We were fortunate that our host’s son and his two cousins, all college graduates in their mid-twenties, spoke English with a high degree of fluency. We spent hours conversing with them; topics ranged from the Occupation, the role of USAID, American attitudes to their plight, their hopes and plans for the future (limited as they are all unemployed and the Israeli Occupation does not allow them freedom of movement and discourages economic development in Palestine), and cultural attitudes in Palestine regarding marriage, women and work, the music they listen to, and the intricacies of coffee drinking when requesting a favor from someone! In the morning, Almad, the host’s son, arrived with a huge tray on which his mother had a traditional Palestiinian breakfast. Newspaper was placed on the living room floor and the dishes spread out. After breakfast, per my request, the young men and our two males delegates joined hands to dance the dabka (with music), a traditional Palestinian dance that we had seen the evening before at the Canaan Olive Harvest festival. It was a unique experience for us all. From the Yassin home, the Separation Wall is visible. The farmers of Anin lost approximately 5,800 dunums to the Wall as it turned eastward from the Green Line, almost half of the village’s land devoted to agriculture. For this reason, the Applied Research Institute of Jerusalem considers Anin as “one of the most doomed villages” on the West Bank. Machomwatch, an Israeli NGO, monitors the checkpoint through which Anin farmers must pass to reach their land. The kafkaesque situations in which Anin farmers are subjected to are well documented on a day-to-day monitoring by these dedicated Israeli women and can be viewed on their website. How must it feel to be young and educated and have no idea of what the future holds for you, your family, your village, your people?